Suitable for any commercial premises or student accommodation. 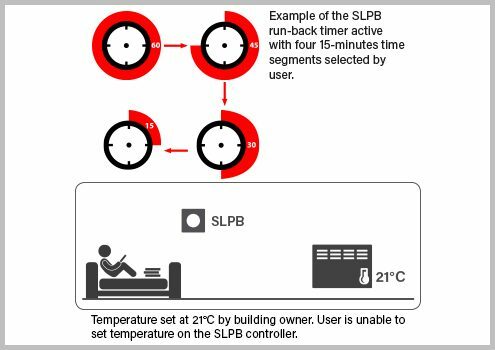 The SLPB allows heaters to operate only when the controller is activated. * Basic: Switches the heater on and off when button is pressed. * Timer: Controller acts as a 4 stage run-back timer where heating period will be active until run-back timer expires. 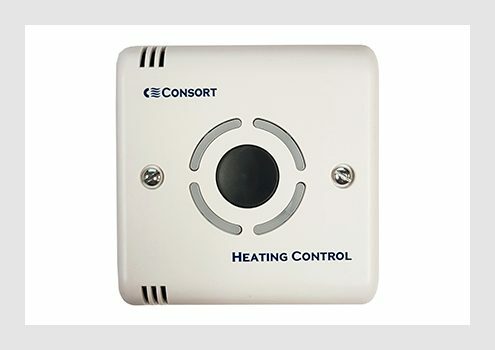 * Temperature control: Features temperature control for comfort and setback periods. The SLPB has one control button, four status indicators and operating modes which are set prior to the controller’s installation. In Basic mode, the controller simply switches the heater on and off when the button is pressed. Timer mode allows the controller to act as a 4-stage run-back timer where the heating period will be active until the run-back timer expires. There is a choice of three time periods available: 5, 15 or 30 minutes. When the button is pressed four times, this takes the run-back time period to 20, 60 or 120 minutes.